I would like to say a few words about me and about the philosophy of my studio. My name is Marie Sokolová and I come from Liberec, Czech Republic where I live and work. I graduated from the secondary School of Economics in Liberec and at the same time studied Experimental Dance School led by František Pokorný. I won a place in the ballet company of the F. X. Šalda theatre in Liberec and spent seven wonderful years there. Then, I was lured into travelling. I worked for Čedok Travel Agency and spent part of my life in Turkey and Tunisia as a company’s delegate. In recent years I have helped with organising sporting events taking care of foreign delegations. 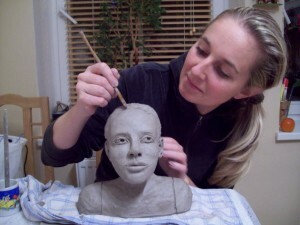 I spend my free time mainly with my family and I also do ceramics and model figures. My path to ceramics began in 2002. It was my desire to create things with my hands that brought me to this kind of art. As everyone else, I began modelling dishes and other simple objects. Ceramics was the exact opposite of my previous life full of travelling, frequent changes and demanding organisation of events. Working with clay requires patience, time and creativity. Born under the ambitions sign of Lion, I had to slow down to learn to respect the clay to be able to create a unique work of art. To my surprise, this hobby of mine has been lasting for nine years and I realised it is not longer just a whim, but a true love. In my studio, I mostly create clay decorations, garden ceramics and figures. I prefer working with fireclay which stands up to my working techniques. I decorate my ceramic objects with a patina, oxides and glaze. At present, I also attempt at sculpture and I wish to fulfil my dream of creating big objects, especially figures in 1:1 ratio. There is lot of work and learning ahead, but it is a challenge I cannot resist. If you have similar desires to try ceramics or sculpturing and you are either beginner or an expert, this is the place to be. The Marie Sokolová PotteryStudio has been built in the former laundry room of our garden. It is not intended for my use only, so I would like to invite everyone who is interested in ceramics to come and try working with clay. The studio also welcomes those who have already acquired the technical skills and would like to create their own pieces of art. You can have access to the studio according to our own individual agreement, regularly or just once, to create a single object. You can work on your own or under the guidance of our experienced tutors. If you are a beginner, do not be afraid; come to the studio and I promise you will take your own creation home and it will give your joy. I would also like to invite children aged six or more to learn how to model clay and create interesting objects. The studio also organises ceramic and sculpture courses for beginners and advanced students as well as thematic workshops. There are individual and group courses; the price includes material, tools and firing in a kiln. Thematic practical or creative workshops are led by a tutor who guides, motivates and inspires you to develop your skills and knowledge. At the same time, the interactive cooperation between the participants and the tutor means you will be motivated and receive valuable advice about your ceramics or sculpturing. Wake your own fantasy up and take a unique piece of art home!